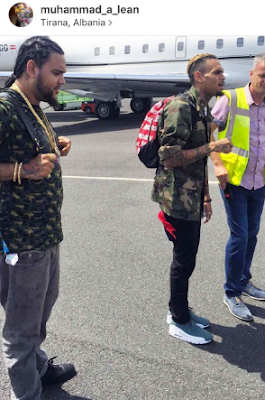 Miami music producer Harrison Garcia, on trial for federal drug charges, used Instagram to upload photos of himself posing with exotic cars, stacks of cash, and rappers Chris Brown and Lil Wayne. But investigators believe he did more than just party with the hip-hop stars. Federal authorities on Thursday revealed they are investigating a $15,000 wire transfer last year from Brown to the bank account of Garcia, who boasted that the money was for drugs and the popular cough syrup-and-soda known as “lean.” And Garcia, when he was first arrested last October, confessed that he sold Lil Wayne “a lot of narcotics,” a federal agent testified on Thursday in Garcia’s trial for drug dealing. …jurors got to see evidence of Lil Wayne — whose real name is Dwayne Michael Carter — and Brown’s involvement in the form of text messages seized from Garcia’s phones. The messages appeared to show Garcia directing his “do-boy” to deliver drugs to Lil Wayne and his crew. “I’ll shoot u some trees,” one message read, a reference to marijuana. “It’s for Wayne,” Garcia allegedly responded via text. 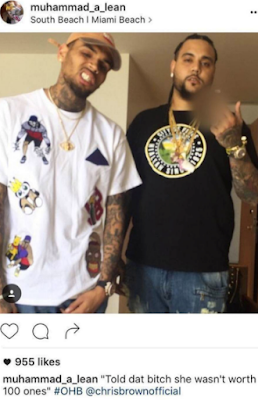 The text message about Brown was more explicit. Garcia sent a bragging text message to a woman of a screen shot of the $15,000 bank deposit from “Christopher Brown” into his account. “Look who put money my account,” Garcia wrote.